The world is tonight mourning the passing of former South African President Nelson Mandela, a global icon and international human rights leader, who is dead at ninety-five. The respected anti-apartheid icon led his country to democracy, becoming its first black president after spending twenty-seven years in prison. Despite his short-lived period in office, Mandela wielded enormous moral influence across the world, as a figure of resistance and triumph over racial segregation. 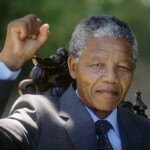 The slogan “Free Nelson Mandela” became the new rallying cry of anti-apartheid campaigners. He was released from prison in 1990 after spending three decades of a life sentence for conspiring to topple South Africa’s apartheid government. Four years later, he rose to power in a historic election. The Nobel laureate succumbed to complications from a recurring lung infection at his home earlier today. The passing of his death has evoked tributes from all over the world. In South Africa, thousands of mourners converged at his residence to pay tribute to their beloved leader. President Jacob Zuma made the announcement. Our beloved Nelson Mandela is dead; but let’s take a realistic look at the man and not the myth. A black man is denied his freedom for 27 years. He is tortured, beaten and abused both physically and mentally; yet, he comes out of prison as an all forgiving and loving man………. especially of white people. He refused to stop and to condemn atrocities committed in the name of the African National Congress (ANC. He agreed to a bad deal for the blacks. Economically, they are still on the outside. The economy is very much ‘white.’ It has a few token blacks but South Africa is still a white man’s land. R.I.P. my beloved Nelson. We loved you as a simple man; but we cannot look up to you as a hero. @UNCLE BENJI – I don’t know who you are but it sounds like you have a problem with forgiveness. You say something is not adding up because he came out of prison with forgiveness in his heart. You know there are people walking this earth that truly do have love in their heart and seek peace and truly do forgive their enemies, I am not saying I am one of them and obviously you are not one of them but I have no doubt that it is quite realistic that those people do exist. He is a hero to me and obviously you are in the minority of the entire world, no one is saying he is perfect because no human being is. However he certainly have done a lot more for his people than most who just sit around complaining and writing blogs onthe internet ananimously. RIP Mr. Mandela and I thank you for your example of real forgiveness. Well said ONCE AGAIN. I doubt that UNCLE BENJI could walk in Mr. Mandela’s shoes, in fact he cannot even fit them!!! !